Summer vacation! As a kid, it meant no school, unlimited time to hang out with friends, trips to theme parks, and so on; as an adult, it can mean jetting away to an exotic island or country to get a taste of something completely different from home. Here at milk + honey, we think that summer vacation can also include exploring your own backyard. 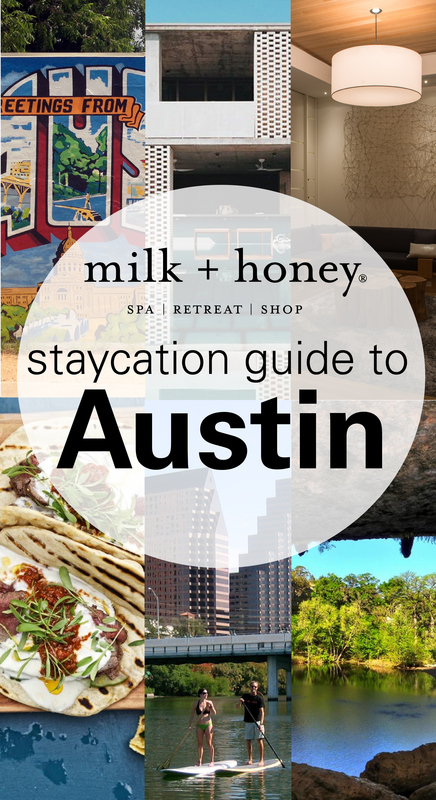 Inspired by the city, we’ve mapped out our ideal Austin Staycation guide. Just like our Houston Staycation roundup, this guide highlights which hotels, restaurants, activities should be on your to-do list. Starting now, you can cool off with our summer seasonal Mint Mojito scrub, which features refreshing notes of spearmint and lime. Made with organic sugar, this invigorating scrub gently buffs away dull, dry skin. The calming aroma of organic spearmint essential oil not only puts your mind and body at ease, but it also soothes muscle and joint pain. The organic lime essential oil is packed with rich antioxidants and nutrients to combat and protect your skin from damaging free-radicals elements. What treatments feature our seasonal Mint Mojito scrub? This treatment infuses organic spearmint and lime essential oil to help purify the skin and relieve stiff joints and muscle pain. Coupled with a full body steam and a 45-minute Signature Massage, this treatment will leave you feeling refreshed and relaxed. Our mint mojito scrub polishes your skin while organic spearmint and lime essential oils re-energize you. This treatment includes the same care as our Lux Combo. Happy Father’s Day! To celebrate, we asked our Spa Partisans to share their favorite Dad memories, moments, and jokes. Father’s Day is almost here and to showcase the love we have for Dad, we asked some of our milk + honey Spa Partisans to share with us some of their favorite memories, inside jokes, and moments with Dad. From starting as a concierge to stepping into her role as Managing Director of Operations, Summer Smith is a familiar face at milk + honey. We paid Summer a visit and tagged along during her daily walk-through at the 2nd Street District location. During our one-on-one, Summer reveals her spirit animal, her favorite part of working at milk + honey, why she loves living in Austin, and so much more. Keep watching and reading. It’s time to indulge your champagne wishes and caviar dreams with Sugarfina candy. This luxurious candy brand features gummy bears, malts, dark chocolates, and other sweet treats from artisan candy makers across the world. Available at all five milk + honey locations, Sugarfina infuses classic confections with the finest champagne, wine, and bourbon.